Last week was a really short week due to resting a mild strain. 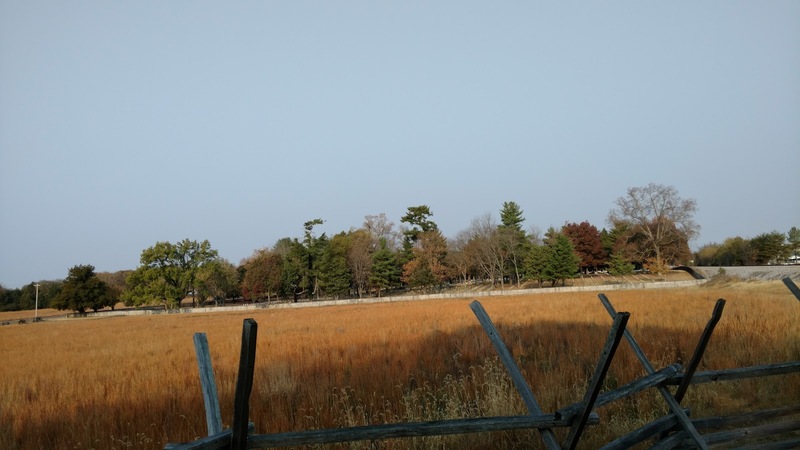 This week was a cautious return to regular running. View of the cemetery at the battlefield; 2 days after Veteran's Day. Since I'm pretty sure my strain was due to running too much elevation too close together, I went to the Murfreesboro Stones River Greenway to run. There's not nearly as much elevation change there as there is at the Nashville Stones River Greenway. I was originally scheduled for this to be a light week and a long run of only 10 miles. I tacked on another mile since I missed a turn and did an extra half mile getting back on track. Not a big deal, though. It was cold to start at 35°, but warmed up to 55° by the time I was done. I wore clothes easy to shed. I wore a pair of mid-weight capris from RaceReady. Because I'm short, they come pretty far down, so only 2-3 inches of skin were visible at the ankle. 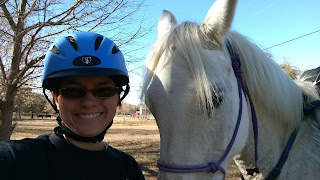 I also wore my favorite Under Armour half zip, silk glove liners and a headband that covered my ears. By mile 3, my gloves were off and in the small pocket of my shirt. I started popping the covers up over my ears around mile 6 and started in on the zipper on the shirt by mile 8. I was cold for the first mile, but comfortable the rest of the run. This was the longest run so far in my Paradigm 2 shoes and no issues. So happy these look like they're going to work out! Happy enough that when I saw another pair on sale 50% off, I snagged them for a backup pair. Around mile 6, I felt a few twinges in my right hamstring. My right leg had the mild strain in the inner thigh. 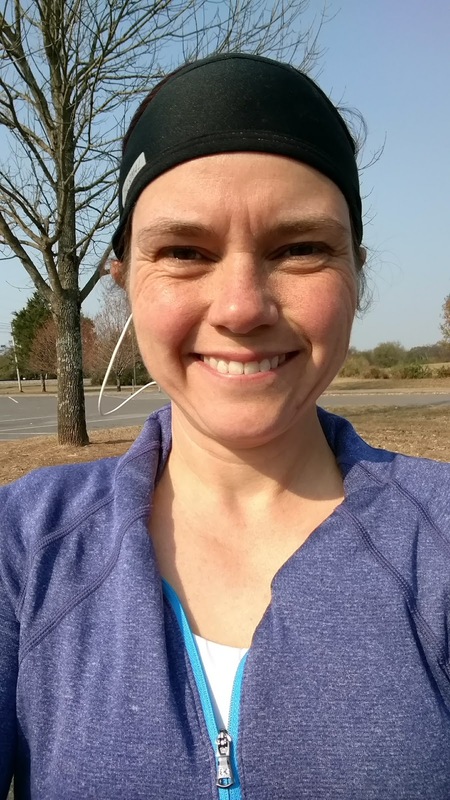 I paused several times during the rest of the run to stretch my hamstring for a few seconds and that seemed to work out ok.
All smiles after a good run. All the outside water fountains on this trail have been shut down for winter, but the visitor's center at the Battlefield was open and they have a very nice water bottle fountain. Also, the bathrooms at General Bragg and Old Stone Fort were open with running water at the sinks, so still plenty of water to be had. All in all, a good long run, even if only 11 miles. This was originally scheduled for a tempo run at a 12:30/mi pace, but since I was easing back into it, I turned it into a run/walk. I still ran at 12:30/mi pace, but only for 5 minutes, then walk for 2 minutes, repeat. I ended up on the treadmill for this run, but I don't remember why I didn't drive out for this run like I usually do. I had absolutely no issues with this run. My leg felt great before, during and after the run. 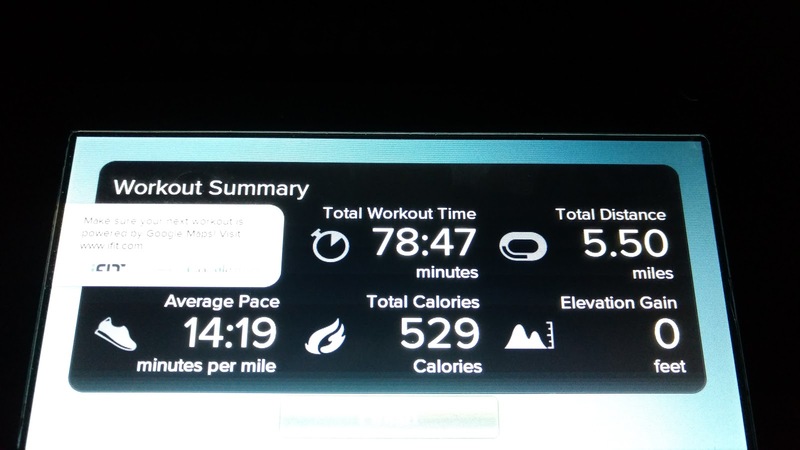 Due to a morning appointment, I didn't have time to drive out for a run, so I ended up on the treadmill again. I still haven't renewed my iFit subscription due to their ridiculous price hike to $144/year (up from $99 just a few short weeks ago!) and the fact that I can't find a coupon code to make the cost more palatable. So I played around with a couple of the pre-programmed workouts on the treadmill. 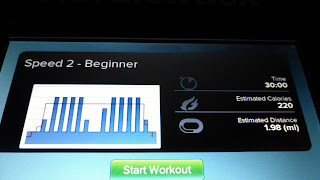 I did a warm up, then I did Speed Workout 2. It was marked beginner and it definitely was. It basically had me run at 14:17/mi pace (4.2 mph) while it changed the incline between 1% and 4%. Surprisingly it wasn't that hard to run that slow with the incline changes. That was a 2 mile workout. Of course, 2 miles isn't enough, so I tried the next workout. Speed 3. This one was more challenging and more fun. It kept the incline pretty much at 1% (small changes to 2% or 3%), but stair-stepped the pace every minute until it had me running at 9:14/mi (6.5 mph) for 2 minutes before dropping back to a jog and ramping up again to finish out at another 2 minutes at 9:14/mi. That was 2 miles also. For my last two miles, I had it run Speed (??) Workout 2 again, but this time I bumped the speed up to 13:03 (4.6 mph) for most of each mile and walked for about 2 minutes. 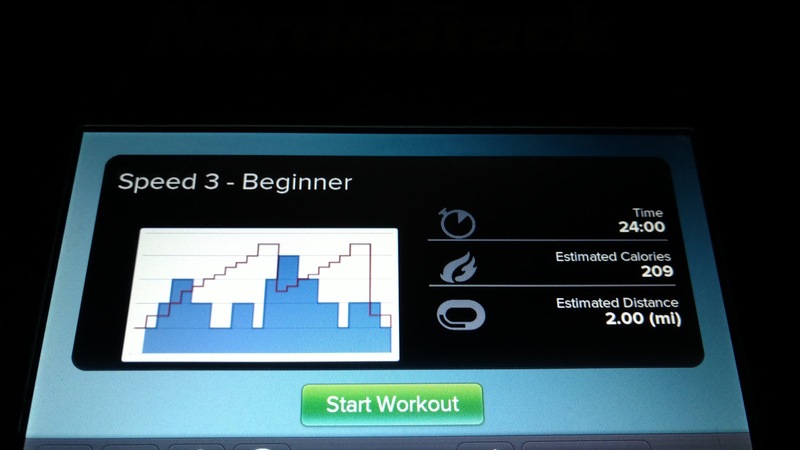 The treadmill continue to change the incline between 1% and 4% per the normal workout, I just controlled the speed. Then rounded out with a half mile walk and a good long stretch. I rather liked this workout. It definitely was more fun to break it up into 2 mile chunks. Back on the treadmill. For just 2 miles, I couldn't justify driving anywhere and I didn't want to go out on the road. This was an easy shake-out run before the half marathon coming up on Sunday. Me and my girl Sasha. Love this horse! I also got to get out on my horse, Sasha, for a couple miles. It was a beautiful day. Maybe the last good day of warm fall weather and I couldn't pass it up. We normally ride for longer than 2 miles, but that was fun and good enough. The Birmingham Magic City Half Marathon will be my long run this week. I'm looking forward to running this as I've never run it before.